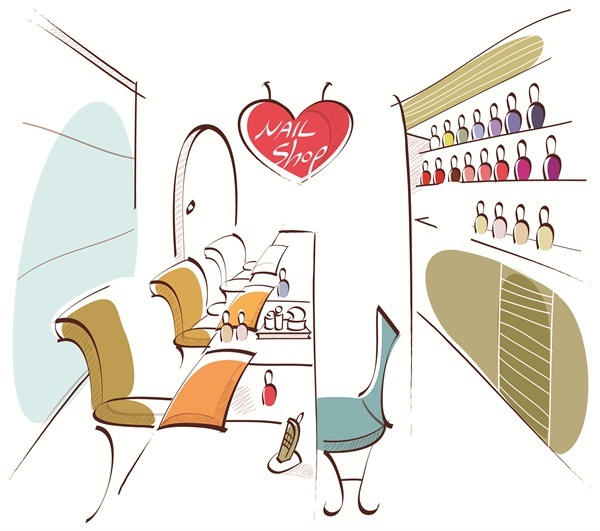 Opening a new nail salon or remodeling and upgrading an existing salon are big projects. Equipment, furniture, products, stock, decor, advertising, signage…the list of expenses goes on and on. Then there is the time it will take for the build-out, before the salon is up and running. Even profitable salons are likely stressed to find the cash to do it right. So, where are owners to look? Where the money comes from will depend on the individual situation of the salon and owners. The money may not all come from a single source. If you are planning to open a salon, it is never too early to hire a CPA and an attorney with experience in the beauty industry. Assuming you have an attorney and a CPA in your corner, it’s time to do some personal housekeeping and planning. Even if you are not personally guaranteeing a loan or lease, lenders will be interested in who they are doing business with. Beneficial Capital advises that prospective clients get a copy of their credit bureau reports from Trans Union (800-680-7289), Equifax (800-525-6285), and Experian (888-397-3742). Review them and correct any items that are in error. Keep in mind that there are some items that will affect your report negatively: late payments, high debt, outstanding collections, liens, bankruptcy, judgments, too many inquiries, etc. Lenders are going to want to see a salon with strong leadership and a well-thought-out business plan. Kopsa reminds us that a business plan is more than just numbers. “The plan shows your marketing plan, your experience, competition, cash flow, and more. There are books and software to help you build this plan,” he notes. Too many inquiries on a credit record may hurt the score, so it may make sense to align yourself with an institution with which you already have a relationship. Talking to a loan officer early in the process may allow them to help you structure your loan and prepare your financial plate. They also know the local economy and may be able to point you to resources in your community. Most salon owners, like Loretta Edwards of Polish Me Nail Studio in St. Georges, Del., financed their salons the old-fashioned way — she saved her money and bought her inventory as she could afford it. “As a student, I saved all my tips from working in the student beauty shop. I started purchasing clearance items that I knew I would use in my studio, such as nail posters, frames, shelves, manicure tables, lamps, etc. After more than three years of searching, I found a quaint space in town and all I had to do was move in. I bought a pair of curtains for $14.99 and the rest was history. Renting a space may be a start, if financing is not available right away. It will also give you a chance to ease into the role of owner and the tasks it involves. Other salon owners (like yours truly) borrow from family and friends. For very small loans, this might work, but it is a mine field of potential problems. Kopsa strongly advises against borrowing from relatives. “This can cause serious family problems if the money is not repaid. For example, grandma may have $50,000 sitting in a 1% CD, but if you borrow the money and for some reason cannot repay, Thanksgiving dinner with the family can be difficult. Believe me, I have seen this,” he says. The biggest obstacles are collateral and cash flow (working capital) for a new or rapidly expanding salon. Both are needed to make a loan bankable. Expect to have enough cash on hand to handle the first year (minimum) of operating expenses. Cash is needed, day-to-day, to keep the doors open while the business stabilizes. Consider leasing equipment. Leasing can solve part of the problem. Your distributor can help you with leasing and may even have staff members with design experience who can help you plan the build-out and avoid over borrowing. They may also have previously owned furnishings and equipment available. Crowdfunding, or social lending campaigns, are growing in popularity. Sites like www.kickstarter.com and www.indiegogo.com have sprung up on the web. Unlike crowdfunding under the 2011 JOBS act, where investors should be prescreened, these small crowdfunding sites allow anyone to invest in someone else’s passions. These sites allow people to design a campaign and have others donate to the cause or venture in return for a reward. The reward may be a T-shirt or a free manicure, etc. People tell their story and entice others to help them meet a goal. Indiegogo.com currently charges anywhere from 4%-9% of what is raised depending on the type of campaign and if the goal is reached and if it is set up as a fixed or flexible funding plan. Care should be taken if you pursue crowdfunding. The IRS has stopped short of declaring if this is income or a gift, so far. As these sites spring up with increasing frequency, they will surely address it. Talk with your attorney and CPA so you are not left with a surprise bill later should they issue a ruling on how these funds are to be reported. Take the time to plan it out in minute detail, giving you lots of cushion for the unexpected. Lay the groundwork, clean up your credit, save as much cash as possible, and reduce your personal debt while you are in the planning stages to set yourself up for the best outcome. Opening a salon is a labor of love. When the paint dries and the dust settles, you will need to be able to sleep soundly at night. After all, you will likely be pulling lots of late nights the first couple of years. You can find industry statistics to include in your business plan at www.nailsmag.com/market-research.